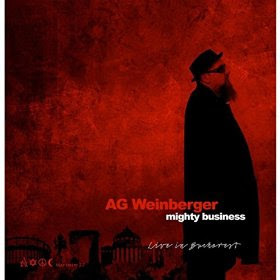 I just had the opportunity to review the newest release, Mighty Business, from AG Weinberger and it's a screamer! Opening with Muddy Waters' Baby Please Don't Go, AG is setting the stage for a red hot blues rocking concert. Backed by Sorin Petrila on rhythm guitar, Vlad Spatar on bass and Miklos Orban on drums, Weinberger handles lead vocals and guitar like a Johnny Winter. Excellent! Adding a bit of funk to a basic R&B style track, Try To Get Into The Middle Of The Real, is damn funky. I really like Spatar's bass chops and backing vocals drive this into Funkadelic land. This is a terrific groove and has plenty of room for some luscious guitar work. I Can't Get Enough takes the train up the southern rock route with a bit of southern swagger. Slowing it down and getting gritty on Sam Taylor's, Mother Blues, Weinberger shows his extremely soulful and fluid guitar lead. This is an excellent track and one that will sit you back in your chair! Classic funk track, Cissy Strut shows off Orban and Spatar's chops and Weinberger riffs like lightning over the rhythm. Very nice! Robert Parker like, Sweet Little Number, has a catchy R&B feel and gives Weinberger the chance to rifle off some hot riffs. A great rocker, this is a great concert. Another Muddy Waters track, Standin' Around Cryin', has some super Muddy like slide work over a classic arrangement of this great track. This band is tight and really laying it down. Charlie Parker's Billie's Bounce takes the band in a totally different direction with an excellent interpretation of track. Weinberger rips up the guitar lead and Spatar's bass work is super. Even Orban gets to take an extended drum solo on this track. One of my favorite tracks on the release. A third Muddy Waters track, The Blues Had A Baby and They Named It Rock'n Roll, gets a total make over with a heavy funk bass line by Spatar and cool rhythm patterns by Petrila. This track has an infectious grove that will have you moving...on the floor or in your seat. Jimmy Witherspoon's Ain't Nobody's Business opens with a red hot guitar intro setting up one of the best versions on this track you have ever heard. Weinberger's guitar and vocal skills are well displayed on this 9 plus minute track. You heard of grip it and rip it... Weinberger does! Big time! Wrapping the release is Take Me To The Highway, a 9 plus minute driving boogie rocker. This track breaks into an improvisational piece showing just what kind of versatility and chops the band has and they should boast. This is super! A great closer for an excellent release! I hate to sound cliché but this guy IS Muddy Waters in Romania!